Remove the two screws in in face of the mobile home switch. These screws are attached to wings that hold the switch in the wall. Once you remove these screws the wings almost always fall inside the wall, but don't worry the new switch has them on it. Once you have pulled the switch out pry the back plate off and before you remove the wires take note of how they are connected. I suggest drawing a diagram, label the wires and even taking a good close up picture with a digital camera in case you forget how it was wired. Now remove the wires by pulling them out of the V slots. Try not to damage or groove the conductors while doing so. Bending the V slots open with a pair of needle nose pliers will help. Now take the new switch and one by one insert the wires back into the V slots the same as they were in the old switch. I have found that the best way to do this is by using a pair lineman pliers also called side cutters to push the wires down. If you notice the wire insulation has a groove in it where it fits into the V slot to insure good contact. Do the new switch the same way. Now that the wires have been inserted into the V slots carefully snap the back plate onto the switch. Before you stick the mobile home switch back into the homes wall I suggest you try it out first. Turn the power back on and try the switch. If the light comes on your in business, insert the switch back into the wall and tighten the wing screws. If not you will need to turn off the power open up the switch back and recheck your connections. Mobile Home Switch Wiring Diagram Remember: You need to cut the hot wire (black wire) in between the V slots for the mobile home switch to operate properly and DO NOT cut the neutral wire (white) or the ground wire as they pass straight through the switch from the power source to the light fixture. Snap In Box and Standard Home Switch Installation This was an answer to an email about replacing a mobile home light switch, but also can apply to site built and modular homes. Yes, you can remove the original mobile homes electrical one piece switch box and use a "snap-in" or an "old work box" and insert this into the hole left by removing the old box. You will first need to enlarge the hole in the wall to accommodate it. Insert the wires into the snap in box slip the box into the wall and tighten the screws to lock it in place. Then just install a standard home switch. I am assuming that this is a single pole switch, meaning that the light is controlled from only one location. Inside the box twist the white wires together and cap them with a wire nut and connect the black wires to the screws on the switch. The bare ground wires will also just twist together in a pig tail fashion and then connect to the ground screw on the switch. More helpful information for testing a switch on the how to find open circuit page. If it is a two gang switch box, no sweat you can get a two gang snap in box and do both switches. 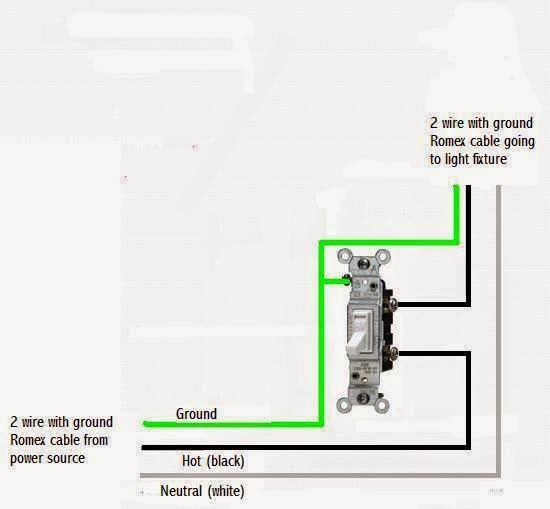 This switch light wiring diagram shows how to wire a light switch is for a circuit that has electrical power coming in at the light switch junction box. For new installation of lighting circuit if the switch controls more than one light you simply pig tail the wiring and then continue on to the homes next light fixture. If this is a replacement of an existing switch you do not need to do anything at the light fixtures. Look at the page for pigtail wiring if you need help. Look at the page for 3 way switch for help with that. Be sure to wrap the wires around the terminal screws on the light switch when wiring a switch. I do not recommend using the quick wire holes for connections to the homes light switch.